Student and designer Cecilia Valentine has an innovative way to wear fur- while it is still alive. Debuting at the Reitveld graduation show, the designer showcased her living wearable’s, where furry pals and pets were worn as part of a series of accessories. Called “Fur is Alive,” the line brings attention to the mortality of the fur industry, while showcasing the natural beauty of each animal in a three-dimensionally printed design. Valentine sought a compromise between fur and the fashion industry, wanting to create a project that would bring to light the issue of killing for fashion, without the gruesome connotations that activism can evoke. Exploring the idea of animal cruelty, she chose to expand on a commonly accepted enclosure for animals- the hamster cage. 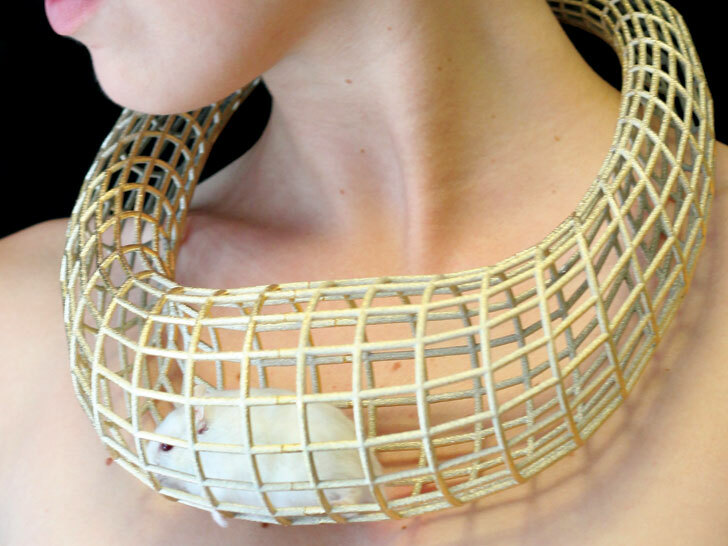 The hamster cage necklace is a thick net-like tube that circles the neck, in which the beloved pet may run around in, much like the tubes in hamster cages. The necklace itself was designed using Rhino, and 3D printed in bronze on a laser melting printer. 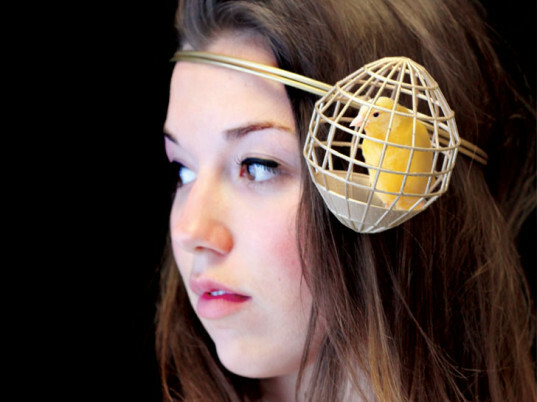 The collection also includes a headband with a tiny egg shaped cage for a fluffy chick, and a bracelet, both 3D printed in bronze as well. But the quirky collection isn’t really meant to be worn, but instead serves as a visual communication. Valentine hopes that her collection conveys the message that fur itself is not beautiful, but that instead the living animal is what is most precious. The Fur is Alive collection lives up to its name literally, connecting the fashion world with the fact that fur was once a living thing. What a knucklehead..how about considering altogether that animals are not here for our entertainment or decoration. They are a vital and viable part of an intricate biotica of which we are a part. A society is easily gauged by how it treats it's fellow species.. this is yet another symbol of no respect for any other living thing. What a sad waste of creativity. Clearly Ms. Valentine is the caged bird, to bad she can't discover her opposable thumbs, let herself out and begin creating something that is truly advantageous and supportive of life. Poor bird, unable to spread wings or walk. Cecilia, living animals are meant to be free. You are giving the wrong message. This is sad and wrong. I hope you reconsider this. Oh dear, it looks like the fashion industry has run out of ideas. A real case of "The Emperor's New Clothes" if ever I saw one. As long as the animals aren't trapped inside this jewelry for too long I think this is a wonderful idea to get the message across that animals weren't put on this earth to cater to every inane whim we may suffer from. I think these would be great for small animal owners to carry pets (for short periods of time) and take them to parks or pet shows. how far will human stupidity? horrible, distasteful and cruel. Unfortunate and cruel, regardless of explanation. "Hell" is paved with good intentions. THE ANIMALS DO NOT DESERVE THIS!!! !...MORE RESPECT WITH LIFE!! Can you make me a necklace with a living dolphin hanging off it please and a pair of slippers from living polar bear cubs thanks. You guys are idiots SHE SAYS HERSELF "But the quirky collection isn�t really meant to be worn, but instead serves as a visual communication. Valentine hopes that her collection conveys the message that fur itself is not beautiful, but that instead the living animal is what is most precious. The Fur is Alive collection lives up to its name literally, connecting the fashion world with the fact that fur was once a living thing." She trying to say not to kill for fur. You dont actually wear the stuff. Its making fun of the stupid fashion industry which murders for fur. Read before you judge. � louca? Ou muito cruel, como pode fazer isso � um ser vivo??? N�o tem alma? N�o tem sentimentos??? Que horror, meu Deus! QUE MONSTRUOSIDADE!!! Espero que a Sociedade Protetora dos Animais esteja a par disso e te processe!!! Vc tem que ser presa!!! This is revolting, an abuse of sentient beings who are not for us to use as live accessories. It is not justified by saying that "fur was once a living thing, (note the use of the word 'thing')." Living beings are not things. This is confinement and imprisonment and should be banned. There are other ways to bring notice to the fact that fur was once a living being. If everyone is so worried about the animals used then go up against the pet industry which has caused these animals to be unfit for living in the wild! Because of breeding programs designed to make the animals "cuter" so they will be more sought after they are in-bred and only suitable for captivity. How wrong is that?!?! WHAT are these idiots thinking? Putting a LIVE ANIMAL in a TINY SPACE is better??? I feel like slapping each and every one of them all around the room!! THis'll work. Also, im going outside to beat up random people as a manifesto against violence. The chick is photoshopped and the mice was only there to take that photo. It's actually a well treated pet. This is a protest, they aren't meant to be worn. Grow a brain. Cecilia Valentine has a remarkable message to convey with this fashion project of conceptualized fashion jewelry. In no way were the animals treated cruelly. In fact she states in her statement about the project the chick was photo shopped into the picture and the hamster was given many treats for his cooperation with the project. The message she so aptly communicates here is that animals are to retain their furs. In no way are we to murder animals for their pelts for fashion, never ever. We as a fashion industry have become so disconnected from our treatment of animals, we don't realize at one time that a rabbit's jacket once belonged to a sentient being. I find this project to be an excellent concept because of how it harnesses the beauty of the animals in it. By putting them in fragile cages it speaks volumes to the injustices they face, however they are alive, as they should be. Student and designer Cecilia Valentine has an innovative way to wear fur- while it is still alive. Debuting at the Reitveld graduation show, the designer showcased her living wearable�s, where furry pals and pets were worn as part of a series of accessories. Called �Fur is Alive,�� the line brings attention to the mortality of the fur industry, while showcasing the natural beauty of each animal in a three-dimensionally printed design.